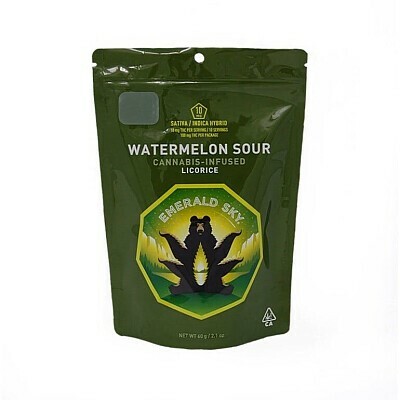 EMERALD SKY- Hybrid Watermelon Sour Licorice (100mg THC) Edibles, Order Weed Online From East Of Eden Cannabis Co.
Emerald Sky has assembled a team of dedicated and passionate professionals, working together to bring to you world-class confections, infused with world-class Cannabis. Our candy manufacturing team has over a century of experience making sweets, with our origins dating back to 1902. Our licorice is produced on the world’s finest manufacturing line, imported from Europe, and with it we make a supple licorice that is both delicious and mouth watering. We use only organic wheat flour, organic cane sugar, organic tapioca syrup and non-gmo corn syrup in our formulations. We never use artificial ingredients - artificial colors and flavors are banned from our products. We infuse our licorice with famed northern California cannabis, sourced from growers within the Emerald Triangle. And we test every batch for potency, with third party lab testing. And all our products test pesticide free. Our Advanced Proprietary Micro-dosing Technology allows us to control the accuracy of our formulations, so that you know exactly what you are buying and consuming. We are proud to be a Bay Area edibles manufacturer. And we are pleased to present to you Emerald Sky, the result of over a century of manufacturing expertise, world wide sourcing, endless testing and evaluating, to provide to you the perfect licorice treat! We strive to produce lip-smacking licorice infused with the highest quality Cannabis, in every single bite!